The first match ended so quickly, we decided to try again. This time with me going first to see how much that would impact the game. Let's find out! I had learned my lesson this time around. He can deal a severe blow to me if i'm not careful. He opts to switch sides, not wanting the forest in the middle to block his Jacks. I deploy a bit more spread out so that my beasts won't have to run through the damn thing. He deploys pretty much excactly the same as last time. Game on! I run everything as far up the board as i can, taking care to not let him get off any charges. He spends a lot of time trying to figure out what to do. He opts to advance a bit, leaving the monk guy up front with the Daughters as a screen. I think it's pretty clear what i have to do here. Feat and jam my cav down his throat to block him out while trying to kill as much as possible. 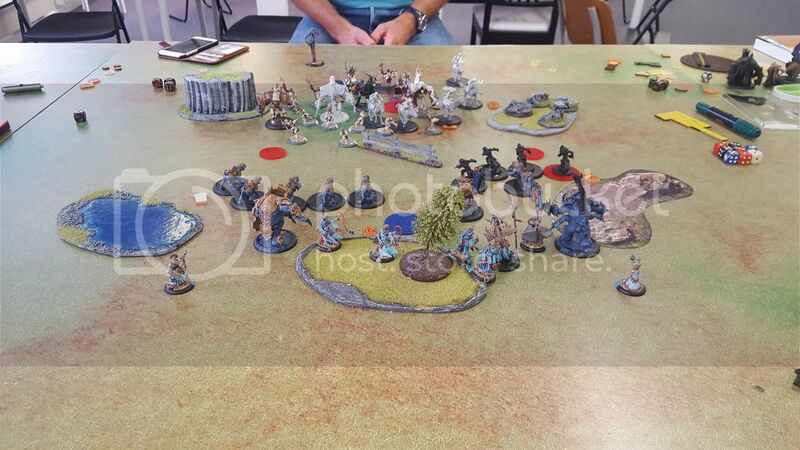 Makeda activates and Feats, both Ferox units jump in, clearing out all the Daughters and the Monk. 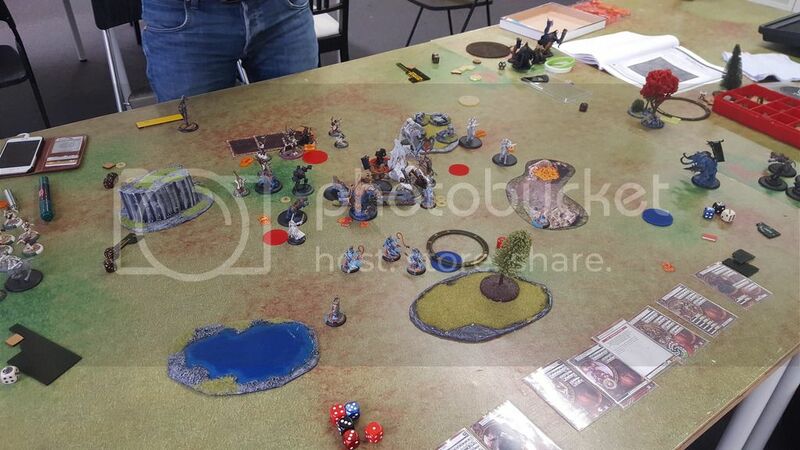 Unfortunately i flop a bit on my damage rolls against the cavalry and only manage to kill one of them. I reposition to jam and block him as much as possible and moves up the rest of my army behind the cats. I think my opponent spends about 15 minutes just thinking about what to do here. He eventually decides to Feat and cast Carnage. 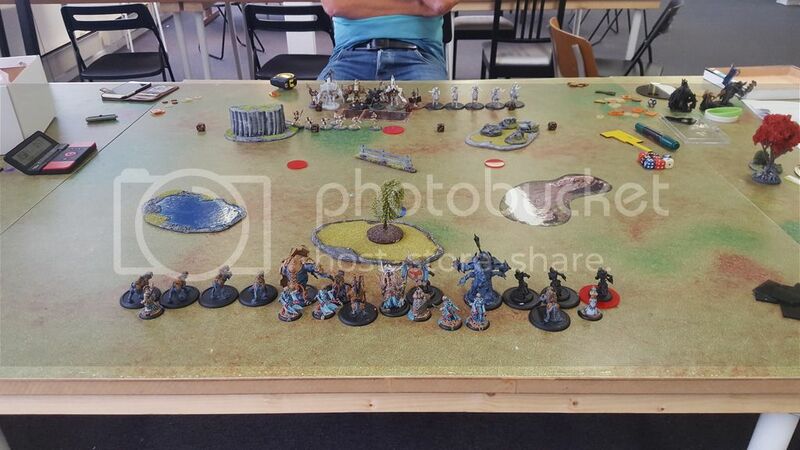 The cavalry charge in and try to deal some damage to my cats to clear the way for Avatar. Turns out i made a huge mistake as i left the Gladiator Just barely within the threat of the big guy. Luckily for me he miss with one of his attacks, allowing me to dodge out of the way and try to Jam the avatar a bit more. 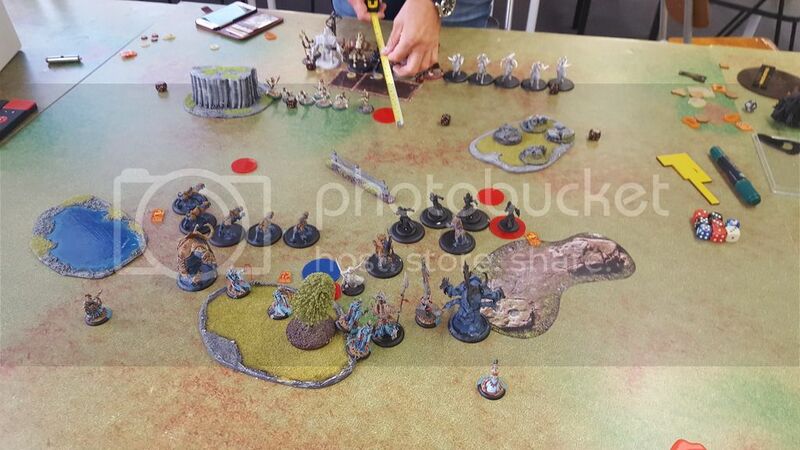 After this my opponent takes even more time to think, before deciding to send in Blood of Martyrs to clear the Jammers out (He had initially hoped to use him to clear out the left unit of Ferox.) Avatar charge the Gladiator, killing it with Focus to spare, and kills another Cat. Scourge and the Dervish kills one cat on my left Flank. Ouch! Loosing the Gladiator means that my means to deal with his Heavies just went down drastically. In addition, almost all of the Ferox are dead. Things does not look to good for me, but my opponent is down to about a minute and a half on his clock, so i'm almost guaranteed to win. Nevertheless, we decide to finish the game anyways. The left Ferox and the Sentry takes out the Scourge of Heresy. 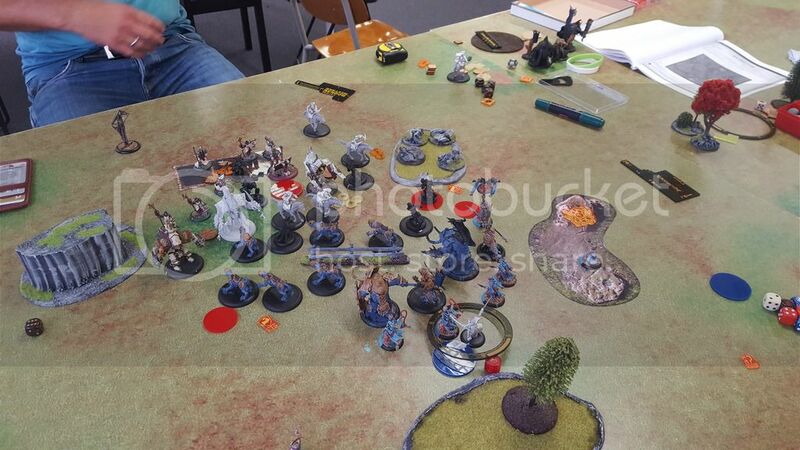 Radheim, the last remaining Ferox on the Right and the TyCom try to cripple the Blood of Martyrs, but i roll misserably and does pretty much no damage. Makeda runs over to the Flag to Score and camp all six Fury. 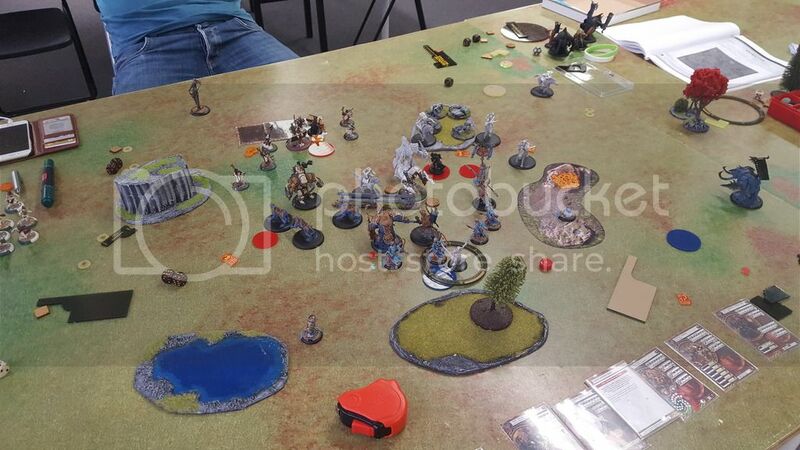 Avatar moves in to kill the Sentry, The cav kills Radheim, The Tycom and the last remaining Ferox on the right. Blood of Martyrs charge the cavalry blocking the Dervish and kills them, allowing the little guy to calmly walk over to Makeda and bonk her on the head for the Assasination win. Getting the first turn makes a huge difference here, and if i hadn't made the mistake of letting him get to the Gladiator, i believe i could and should have won this game. Both my heavies were perfectly positioned to charge in, probably killing two of his heavies and cripple his ability to deal significant damage to me. I really need to stop making these silly positioning errors. With the ability to pre-measure everything mistakes like that generally shouldn't be made.